Tending Corn and Boys | Redeemed! Gazing across the vegetable garden with a sense of pride mingled with hope, I see the plants are all sprouted and growing nicely. The corn, my personal favorite, is 6 inches to 24 inches in height, depending on the individual plant. And the weeds! The weeds have begun to flourish as well. If I don’t act soon, they’ll take over the garden, choking out the infant vegetables. With a sigh, I grab a hoe and get to work. I hoe the weeds up one side of each corn row, stopping just short of the corn. Reaching the end of the row, I turn and come back down the other side, this time hoeing between the corn plants themselves, within the row. 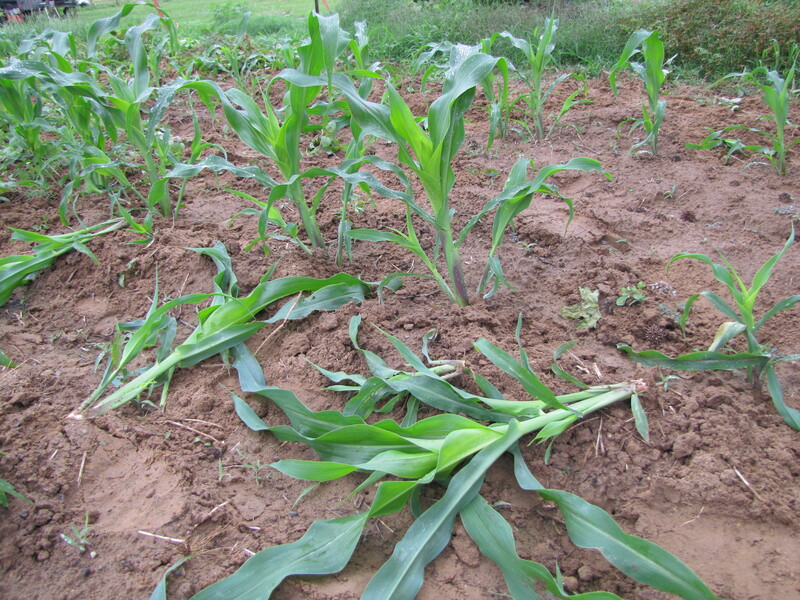 Except this is the season’s first weeding, and many of the corn plants are too close. So, as I hoe the weeds, I also methodically thin the corn plants. Dawson, our 10-year-old, comes out asking to help. I’m pleasantly surprised by his request. Everyone gets excited about planting and harvesting, but the drudge of daily garden tending is usually left to me. Dawson seems pleased when I ask him to finish out the row. He takes the task seriously, asking which plants are too close. Walking down the row I find three plants crowded close together, with the tallest in the middle. This is a tough decision for Dawson. After careful consideration, he culls the tall plant. Although laborious, eradicating weeds does not require difficult choices. The hard decisions are in deciding which healthy corn plants to keep and nurture, and which to cull. Walking back to the house, I’m thinking not about raising corn, but about raising boys. I recall the decision, last year, to cease involvement in our church children’s program, after over twelve years of teaching God’s word to young boys. I still support the program, and believe it to be a valuable ministry, but felt I could no longer be directly involved, due to schedule constraints. Weekday evenings have become a carefully protected time in our family, as we help Dawson with his school work. The ADHD medicine helps him focus enough to work in the class room, but has worn off by the time he gets home. He struggles to complete the homework that increases with each advance in grade level. Lord, please grant us wisdom in maximizing Your influence in this young man’s life. Holy Spirit, please cause God’s word to sink deep roots and flourish in the fertile soil of his tender heart. Have you ever ceased involvement in a valued ministry to focus on another calling? This entry was posted in Ministry, Parenting and tagged living, love, ministry, nurturing, pruning, raising children, tending crops by joe. Bookmark the permalink.